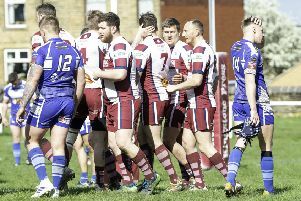 Mirfield Stags pushed undefeated Yorkshire Men’s League Premier Division leaders Sharlston Rovers all the way before being edged out 27-22 last Friday. The Stags started superbly and raced into a healthy lead during a one-sided opening quarter before reigning champions Sharlston hit back. Lewis Martin completed a flowing move, started by player-coach Francis Maloney, to score a sixth minute try. Martin doubled his tally shortly after, crossing in the left corner, and Mirfield extended their advantage via the boot of Braden Hunter, who added a penalty goal, having converted both tries, to make it 14-0. Josh Field hit back for Sharlston and pressure told when Adam Jones reduced the arrears further with eight minutes of the first half remaining. Jack Kirmond, brother of Wakefield Trinity forward Danny, edged the visitors in front at half-time, stretching out to score from close range. Jorge Richardson extended Rovers’ advantage early in the second half and Jones grabbed a second try before Jake Richardson added a drop-goal. Wayne Wilson posted a belated Stags response and Leon James set up a tense climax with a try out wide, as new coach Maloney looked to inspire an incredible fightback. But the experienced Rovers clung on to claim another two points, moving them further clear at the summit.